I was asked by my friend Jahn to create a piece of art reflecting her life: growing up and the things she loves. I listened to stories and sorted through photos. Since she has a stunning art collection, I already knew her taste in those areas. Starting with the base, which was the bottom of a rusty oil drum backlit with cold cathode fluorescent lights, I mounted a bicycle wheel that actually spins. Resting on the spokes were three sections of a world globe and bands of a cutup Scrabble board. Three supports, made from the back slats of an old office chair my friend Al gave me, had a laminated pattern of the ceiling of the Cataldo Mission in North Idaho and lights on the underside to illuminate the drum and globe pieces. 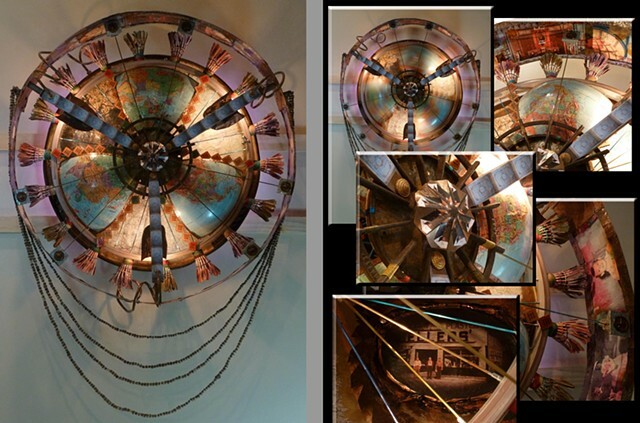 Twisted copper tubing brought power to the lamps. Surrounding the perimeter was a cylindrical ring with family photos on the inside and painted simulations of Columbia Plateau Indian petroglyphs. Did I mention, the wheel spins?